Sea turtles have existed since the time of the dinosaurs. But now, suddenly, the turtles are dying, ravaged by a mysterious plague that some biologists consider the most serious epidemic now raging in the natural world. Perhaps most important, sea turtles aren't the only marine creatures falling prey to deadly epidemics. Over the last few decades diseases have been burning through nearshore waters around the world with unprecedented lethality. What is happening to the sea turtle, and how can it be stopped? 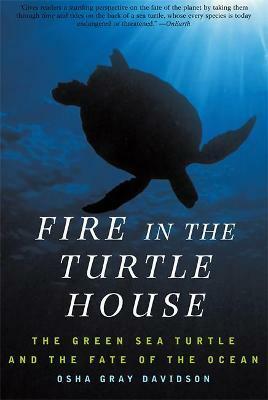 In this fascinating scientific detective story, Osha Gray Davidson tracks the fervent efforts of the extraordinary and often quirky scientists, marine biologists, veterinarians, and others racing against the clock to unravel a complicated biological and environmental puzzle and keep the turtles from extinction. He follows the fates of particular turtles, revealing their surprisingly distinct personalities and why they inspire an almost spiritual devotion in the humans who come to know them. He also explores through vivid historical anecdotes and examples the history of man's relationship to the sea, opening a window onto the role played by humans in the increasing number of marine die-offs and extinctions. Beautifully written, intellectually provocative, Fire in the Turtle House reveals how emerging diseases wreaking havoc in the global ocean pose an enormous, direct threat to humanity. This is science journalism at its best. Osha Gray Davidson is the author of The Best of Enemies: Race and Redemption in the New South The Enchanted Braid: Coming to Terms with Nature on the Coral Reef, and other books. His work has appeared in many publications including The New York Times, The Los Angeles Times Book Review, and The New Republic. He lives in Phoenix, Arizona.